Huawei has already confirmed the launch date for its P20 series of smartphones. The devices are set to be unveiled on March 27th at an event in Paris. As we are inching closer to the launch date, more info about the devices has started showing up online. As you may or may not know, Huawei is said to unveil both the P20 Lite as well as the P20 Pro along with the regular variant. 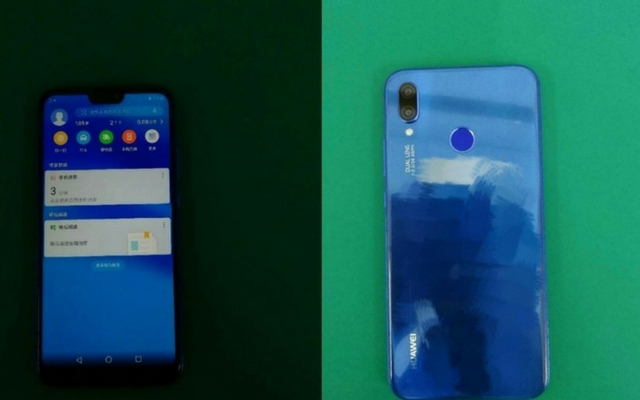 While we are waiting for the P20 Pro to break cover, the live photos of P20 Lite smartphone in a blue coat of paint have surfaced online. As seen in the images revealed on Weibo, the Huawei P20 Lite is seen rocking the dual-camera setup. Huawei appears to have gone for a vertical arrangement of the lens, and it doesn’t stick out like a sore thumb. Judging by the reflective nature of the back, it appears to be made up of glass. That being said, the fingerprint scanner appears to be made up of a different material as it reflects a different shade of blue. Sadly there’s not a lot to talk about the front of the device since the image appears to be taken in the dark. But if the rumors are something to go by, then the P20 Lite is expected to come with a 5.84” FDH+ display. As you can see, Huawei is also joining the bandwagon by placing a notch on top of the display. As for the specs, the Huawei P20 Lite is expected to be powered by the Kirin 659 SoC. It will be coupled with 4GB of RAM and 64GB of internal storage. Coming to the optics, the Huawei P20 Lite will have a 16MP+2MP camera combo on the rear, and a 16MP selfie camera on the front. The device is also said to be powered by 3,000 mAh battery and run EMUI 8.0 software out of the box. As of now, there’s no official word about the pricing and availability of this device; however, it is expected to ship with a price tag of €370.